BELIZE CITY, Thurs. 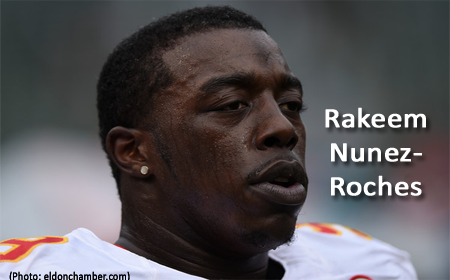 Jan. 12, 2017–American-football fans will be focusing on the NFL playoffs this weekend, and one Belize-Dangriga born player, Rakeem Nunez-Roches will be among the Kansas City Chiefs that clash on Sunday against the Pittsburgh Steelers at the Arrowhead Stadium in Kansas City, Missouri. The picture above (from Evan X Hyde’s files) was partly damaged, but we salvaged the portion showing (at the MCC Grounds, with the Belikin and Guinness pavilions in the background) some Milpros players, including Raul Roches.